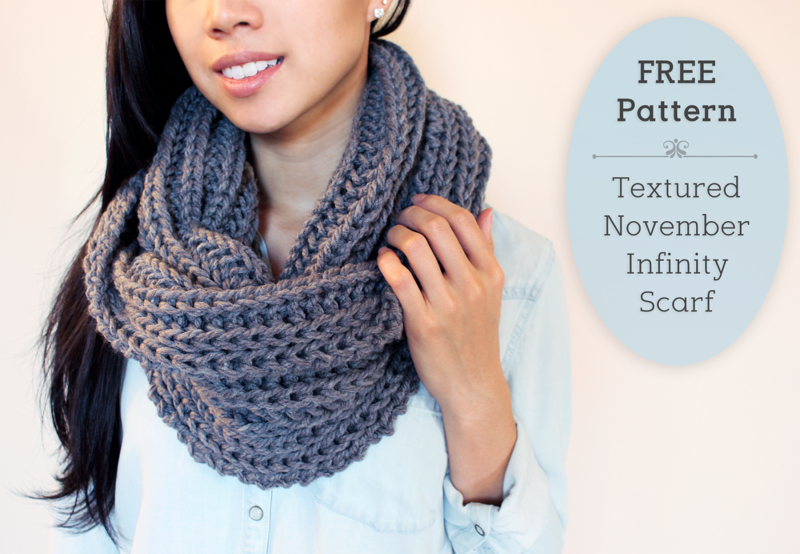 The 'Textured November Infinity Scarf' is a thick, textured cowl style circle scarf that will keep you warm from fall through winter. Simply drape it around your neck and over a t-shirt for an effortless style, or wear it as an extra layer for your fall and winter outfits. 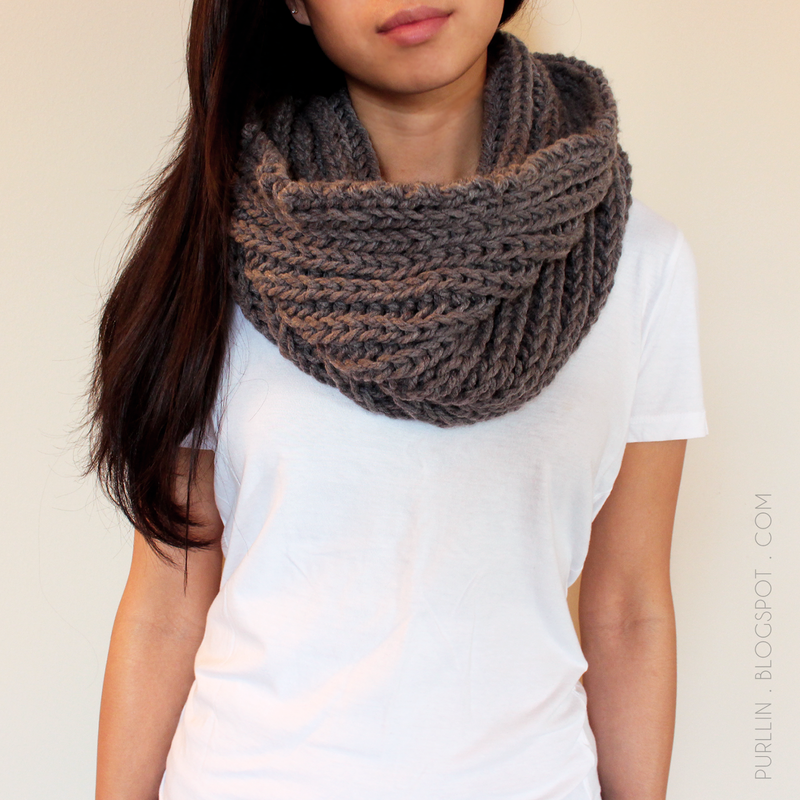 The scarf is large enough so you can fold over the top or bottom edge of the scarf to create a more layered look. This scarf is simply the fisherman's rib knit with straight needles with the two ends joined together. It's a great project for beginner knitters. Watch the video tutorial of how to knit the fisherman's rib here. My scarf ended up being 30 inches in circumference & 12 inches in width. I decided to go with a neutral grey so I could easily pair it with a variety of pieces from my closet. Use whichever color your heart desires! * If you cannot find the Bernat Chunky Yarn in the color you like, you may use any yarn that is weight category 6 and calls for a US size 11 needle. I knit from the 'Bernat big ball yarn' and used about 1/2 of the skein (~300 yards). The amount of yarn you need will depend on how tight/loose you want your scarf to hang around your neck. Money saving tip: If you decide to purchase your materials online, don't forget to shop through a cash back link. I most commonly shop through my Discover credit card cash back program or ebates. Ebates offers up to 4% cash back for Amazon.com purchases (depending on the item category). You can sign up for ebates here; it's super easy & quick. Repeat rows 2 and 3 until desired length*. Bind off, join the two ends together, then weave in the ends. *I knit until my piece measured 30 inches in length. You can test the length by wrapping your work around your neck carefully with your work still on the needles. 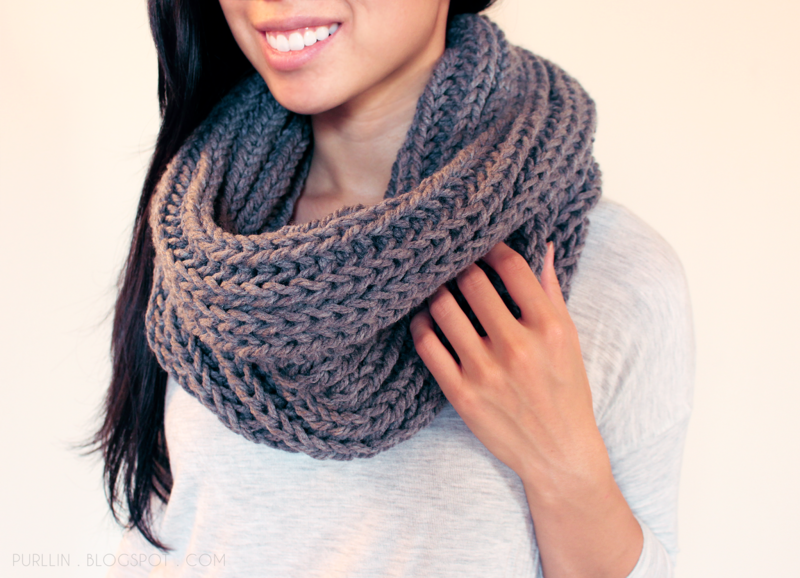 I've always liked styling a chunky infinity scarf against a plain white t-shirt. 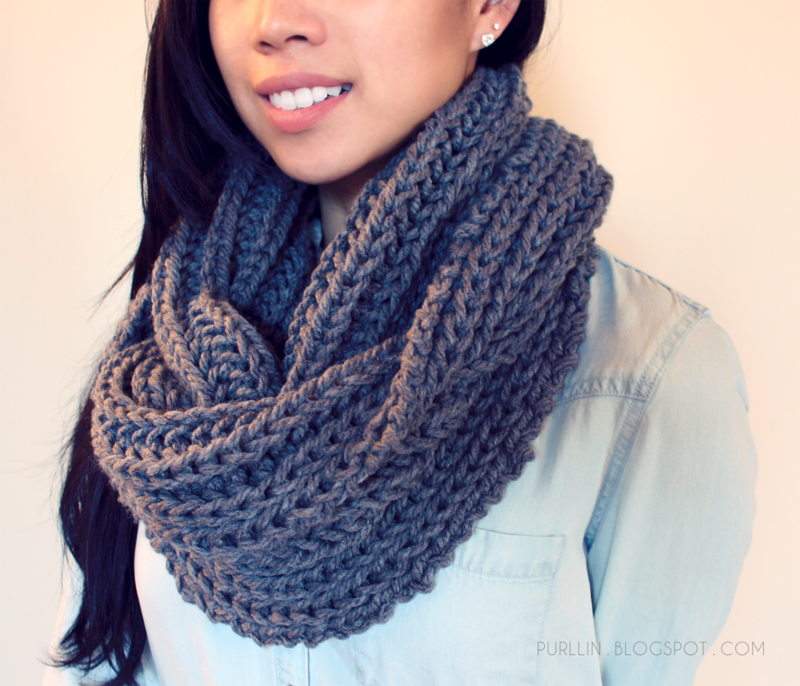 You can't go wrong with a thick & cozy infinity scarf over a light denim button down. I CO 35 stitches and when I finally finished he scarf it was skinny at the bottom and then wide at the top. Since there are no decreases in the pattern, it should be the same measurement from the bottom to the top. Unless there were stitches dropped somewhere in between, or if some of your stitches were tighter than others. Hope that works : ) good luck! Do you have any tips for connecting the ends? The scarf turned out beautiful, but my seam is so messy. I've already pulled it out twice. Thanks! Wonderful video, Lisa. I was curious if you have made any progress in coming up with the best way to connect the two ends together? Try using a crochet hook and use the *slip stitch* to join the two ends. Just leave enough yarn on the end of your work after you cast off. Works a treat. Ok I'm new to knitting So if this question is dumb please don't judge. Ok so would this pattern translate correctly to knitting in the round? Or would changes have to be made? Hope my explanation makes some sense! : ) Happy knitting! How many grams of wool do you need to make this? I used a little less than half of the large ball of yarn shown in my photo - so I would estimate approximately 150 grams of yarn. It depends how long you want to make your scarf, though : ) Hope this helps! Aw, yarn for 10mm needles is going to be quite chunky and thick. You can definitely use it, but you may want to use size 13 or 15 needles (9 or 10mm needles) or else your scarf may come out too tight and stiff. Hope this helps! Sorry about the discrepancy! 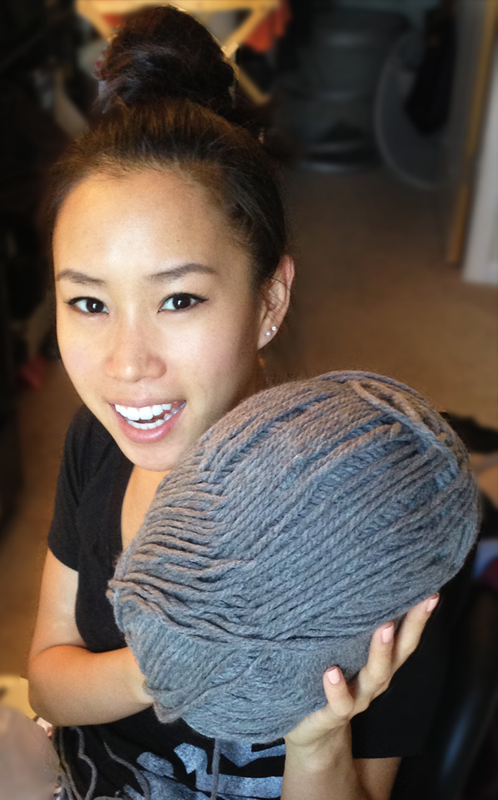 It was closer to half the large ball of yarn, not 3/4! I will fix that in my post. It's always best to have more yarn leftover than not enough - so usually I round up when estimating how much yarn I'll need. Sorry for the late reply :( Hopefully this will help someone! I'm a beginner and I'm practicing your pattern. Most of the time it's going great but once in a few rows I drop a stitch and I don't know how to fix it. I'm finding myself unraveling the whole scarf again and again. Check out the video of a new tool called "fix-a-stitch" (Amazon.com @ $14.00.) Since picking up knits and purls requires different techniques,this is a useful little gadget for knitters to have. How long is your scarf in this tutorial? I'm having a hard time deciding what length I want mine and I really like the length of the scarf in the pictures. So pretty and such a rich texture - it lays perfectly! Thanks so much.. So for the row 3, I knit 1, purl 1, knit 1 under twice, then knit 1, purl 1? Please let me know if I'm readin it right! I mean after knitting under twice, I purl 1, knit 1. Correct? I find myself gaining a ton of extra rows when I'm beginning. I casted on 29, but I was in the upper 30's by the time I was starting my row 3. I don't know where I'm going wrong and I've restarted the scarf so many times. Do you have any ideas? I had this issue when I was learning how to purl, if you don't have your yarn on the right side of your needles it will be wrapped an extra time giving you an additional stitch when you purl. Make sure the yarn is on the inside of the needles when purling (behind when knitting). Maybe that helps? Hi Rachel! I think you also posted this question on my fisherman rib tutorial on YouTube but I will answer here as well in case anyone else runs into the same issue. One tip is to make sure when you do the K1B (knit 1 below) you slip the stitch above off needle at same time. The circumference of the scarf ended up being about 30 inches : ) If I had to do it over, I'd probably only make it about 26 inches so it would fit a bit tighter around my neck. I can't remember exactly how long it took me to make this, but I'd guess you can finish it in a weekend if you really put a few hours a day into the project : ) I'm actually a pretty slow knitter! Shop the latest collections of knit infinity scarves on Stylishfit.com. Is it possible to knit this with circular needles and it still turn out the same way? I only use circulars when knitting, unless I need to switch to double pointed needles. Just don't join your stitches and you're good. Simply turn your work around when you finish your row. Any suggestion if i want to use 2 different colors how should i proceed? ?